Let's hear it for ... Yudzhin Dzheter? 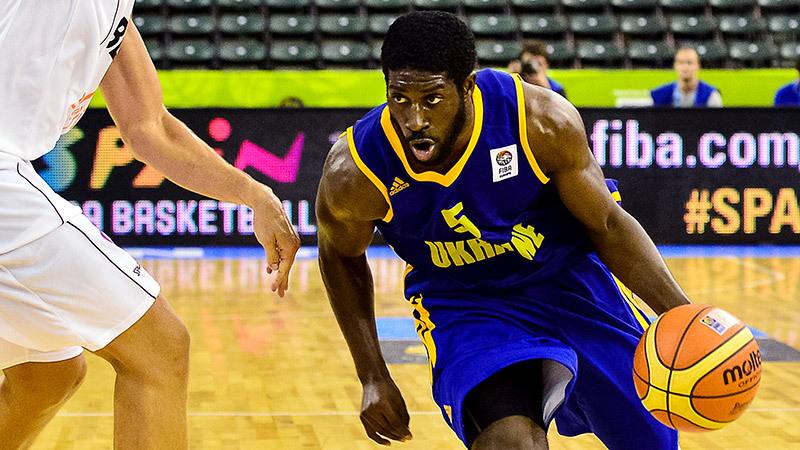 Former Sacramento Kings guard Pooh Jeter is thriving for Ukraine's EuroBasket lineup in Slovenia. LJUBLJANA, Slovenia -- Pooh Jeter lets out a loud scream. Punches the air. Hugs everyone in sight. High-fives a volunteer. This win, against Germany, meant something. Everything. "We wanted to win so bad," he proclaims. Just what you'd expect when patriotic pride, as well as the quest for victory, has been satisfied. One step forward for Ukraine at EuroBasket. Another stop on a personal journey that came out of the blue. Last summer, Jeter went to the Olympic Games in London as a paid-up cheerleader for Team USA. The California native retained a personal stake. His elder sister, Carmelita, is a world champion sprinter, who would accrue a gold medal in the 4x100-meter relay as well as a silver and bronze from her individual events. But he had also grown up with James Harden, Russell Westbrook and Tyson Chandler, the West Coast collective on the United States basketball team. Follow along as the world's top basketball teams compete in qualifying tournaments for the 2014 World Cup of men's basketball. "I was sitting there, watching them all," he recounts. "I was thinking: 'I want to play in something like this.' Then, later on, I had a call from Sasha Volkov. 'You want to play?' he said. I was like, 'Wow, yeah!' Watch what you pray for. Because it might come true." Volkov, a one-time player with the Atlanta Hawks, is now a member of the Ukrainian Parliament, as well as serving as president of the country's basketball federation. He had already gone back to the United States to lure his former coach Mike Fratello into a part-time gig in charge of the national team. Planning ahead, the pair felt their prospective roster needed an upgrade at point guard. With the power and influence to instantly grant citizenship to any potential recruit, they threw out some names and it was Jeter's which stuck. He had played a year in the country, for Volkov's club BC Kiev, but other boxes were ticked. Fratello's assistant, Joe Wolf, had coached him as a rookie in the NBA D-League while another member of the staff, Eric Glass, had taken a close-up look during a training camp stint with the Miami Heat. "We looked for character, that was important," Fratello, now primarily an analyst for TNT, recounts. "Guys who, when it's not going the best, they hang in there ... Every recommendation we received on Pooh was that he was a high-character person, a guy who would fit in, a guy who would understand what it was about to represent a country. As a result, he was our choice." So here he is, wearing yellow rather than red, white, and blue, playing for his adopted country in Slovenia rather than chilling back in Los Angeles. He even has a new official name: Yudzhin Dzheter. Although, with FIBA Europe's regulations listing only birth names, he has also had to hear himself called something else unfamiliar. "It's weird here," he laughs, "when the announcer says, 'Eugene.' People don't call me that. I was called Pooh in school, from whenever. The only time I heard Eugene was when I was in trouble." He's avoided that so far. Ukraine is a surprising 3-0 and on track for the second round. Jeter, now 29, is their resident veteran, providing spells of scoring but principally acting as playmaker and Fratello's voice on the floor. Barring a strange mathematical improbability, the Ukraine will advance from Group A. But why, he says, take chances? "We have two more games. And now our focus is on France." It has been a vintage year to date. Jeter spent the past season in China, joining the Shandong Lions, where he was a catalyst for their run to the championship series. The team, located in a province of some 100 million people, provided him with everything he could require: a driver, a translator, all the comforts of home. "They make sure you're good," he said. "They put you in a nice place." He was even granted an endorsement deal with shoe company Li-Ning, joining the likes of Dwyane Wade and Jose Calderon on their celebrity list. Consequently, he has already signed on in Shandong for another two years. China is the sixth country on the professional résumé Jeter has established since coming out undrafted from the University of Portland seven years ago. Ukraine aside, he had two years in Spain, another in Israel, plus one season in the NBA with the Sacramento Kings. Some grow tired of such uncertainty, of waiting every summer for an acceptable deal, of wondering if theirs will be a team which pays on time or always on the day after tomorrow. Jeter has no such hesitation about heading overseas. "I'm so used to being gone. I haven't really been home since I was 18. I've been on this journey from college. The best thing about China is the season is just six months so I was home by April. So when this opportunity came, I was happy for it." Same with Ukraine. In 2015, it will be the hosts of EuroBasket and this summer is considered as part of the building process to make sure it can compete on home soil. Like Fratello, Jeter has been offered no guarantees that he will return next year. As with everywhere else he has gone, he will enjoy the moment and worry later about what might lie unexpectedly around the corner. Slovenia is just one more stop. "It's like I'm on a world tour," he states. "The Beatles, they went everywhere. I go everywhere. I've been blessed to travel and do something I love to do. I'm thankful for it. Who knows where I'll be next?" In life, as they say, the joy is not in the destination but the journey.